Kirill Serebrennikov was arrested on highly contested fraud charges last August in the middle of filming “Summer” (“Leto”), his long-awaited biopic about the late Viktor Tsoi, a 1980s Soviet rock hero. When the arrest happened, the film crew thought that soon the charges would be dropped and he’d be back at work. But Serebrennikov has been under house arrest ever since. At the time of Serebrennikov’s arrest, about three-quarters of the film had been completed and only two scenes remained to be filmed. A scene that had been rehearsed the day before was filmed the next day. The second scene was shot a month later following the director’s precise instructions and with videotaped rehearsals. Later Serebrennikov’s lawyer gave him a hard drive with the raw footage, and the director personally edited the entire film while under house arrest. “Summer” is story about life in and around a famous Leningrad rock club in 1981. It explores the relationship among three real people: Mike Naumenko, the front-man of the band Zoopark and one of the key characters in the Leningrad rock scene, his wife Natalya Naumenko and Victor Tsoi, who founded and led the band Kino. 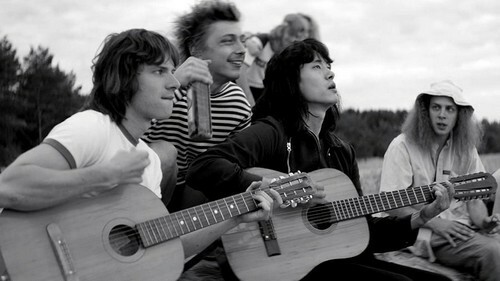 Mike Naumenko is played by rock musician Roman Bilyk from the group Zveri, while up-and-coming Russian film star Irina Starshenbaum plays Natalya and Korean actor Teo Yoo plays Tsoi. Since Yoo doesn’t speak Russian, one actor dubbed his speaking parts and another dubbed his singing. The film is a flashback for anyone who lived in the early 1980s and was a part of the rock scene. It’s shot in black and white until the first musical numbers, which are in color and reminiscent of early homemade music videos. The music includes covers of western artists, including the Talking Heads, Iggy Pop and Lou Reed. But most of the musical numbers in the film are covers of the original songs by Tsoi and Kino, as well as Zoopark. “Summer” tells the story behind the creation of such early Kino hits as “Vosmiklassnitsa” (High School Girl) and “Bezdelnik” (Loiterer). Both became part of Tsoi’s first album, called “45.” The recording of the album, produced by 1980s rock veteran Boris Grebenshchikov, is also a part of the film. Grebenshchikov himself publicly stated that the movie is “all lies” after reading an early version of the script. Although the script was loosely based on Natalya Naumenko’s memoirs, the story is fictional. Lily and Michael Idov, the screenwriters, did not consult Naumenko, although Serebrennikov did. “For me, it’s not a movie about Tsoi or Mike, and not even about the Leningrad rock club. I understand that this sounds tacky, but it’s really a film about love and friendship,” Idov said. Although many guests at the Cannes Film Festival wore “Free Kirill!” T-shirts, the film didn’t earn any awards. This may be partly due to so many references that are easily understood for those who grew up in the Soviet Union but might be lost on foreign audiences. For example, there are references to the dangerous kvartirnik — an illegal concert that took place in someone’s private apartment. Or the lines that get laughs from older Russians in the audience, like “There’s only two types of wine: good and very good.” This is a joke about the scarcity of good-quality wine under Leonid Brezhnev. Viktor Tsoi died in a car crash in August 1990. Mike Naumenko died in August 1991 of cerebral hemorrhage under suspicious circumstances. Kirill Serebrennikov has been under house arrest since August 2017. See The Moscow Times Listings for screenings with English subtitles.